Prothane manufactures their motor mounts with polyurethane which holds it's shape much better than rubber under the stress that a revving engine can cause. Prothane Motor Mounts replace the stock rubber mounts in your vehicle with polyurethane, providing a firmer engine to frame connection that will increase accelerator response and last much longer. Find Prothane's motor mount for your vehicle below. Stock rubber motor mounts do a good job of absorbing vibration, but when it comes to keeping the motor in place they are not the best option. When your engine is resting on a loose or degraded rubber mount the sudden torque of acceleration can cause it to shift. This decreases throttle response, power to the wheels, and could even cause damage under the hood if the the engine shifts too much. For a dedicated track car solid metal mounts are a good option, but if you want to take that car on the highway you're in for a rough ride. Prothane's polyurethane motor mounts give your engine a much more stable foundation than rubber but don't saddle you with the harshness of metal racing mounts. 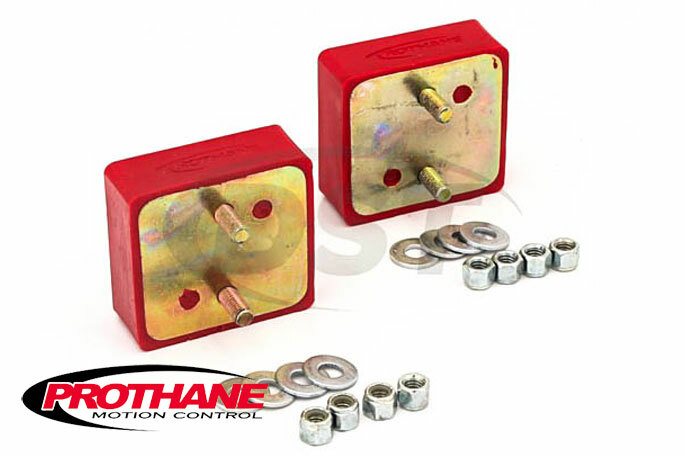 Prothane manufactures their motor mounts with polyurethane which holds it's shape much better than rubber under the stress that a revving engine can cause. Polyurethane also brushes off engine fluids and other elements that cause rubber to break down faster. Since these mounts are stiffer than the originals there will be more vibration passed to the driver, but the increase in throttle response and secure drivetrain alignment makes these mounts the perfect middle ground between the comfort of rubber and performance of solid metal racing mounts. Made in the USA, Prothane's motor mounts are covered with a Lifetime Warranty.